Just wanted to reach out and say that I think you ( & crew) are doing an awesome job holding these scammer scumbags accountable for their actions. 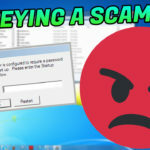 All your videos are excellent especially the ones where you get the scammers to rage when you waste their time, syskey and infect their computers with a mems trojan! Priceless! Especially enjoy you cussing them out with hindi swear words-quite entertaining! They get so pissed off it’s hilarious! Shutting down these vermin is a must! Keep up the fantastic work! If I lived closer I’d splurge for a few rounds of ale a a local tavern for you & crew! All the best! Cheers!